What’s so “hybrid” about them? This new innovative pair of training pants uses either disposable inserts or cloth inserts. 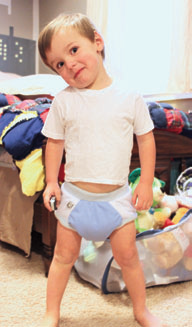 It can instantly switch identities from a potty trainer to a much needed diaper. And with its adjustable front, it can fit a two year old or his four year-old sibling. This dynamic two-tone piece of goodness has changeable inserts that fit in a wonderfully waterproof shell, so now you can just replace the inserts, not the undies! This allows reusability. This creative solution solves the issue of a potty training of a toddler going through seven to 10 changes, just for peeing a little bit while running for the potty. While one insert gives you potty training absorbency, two inserts instantly transform these Hybrid Undies into a versatile diaper. Flipping between potty-training readiness, and the world of “not so sure?” The Super Undies Hybrid Undies are your answer. Gentle enough to potty-train any toddler, but super enough to fully relieve you of the burden of disposable diapers, even through nap time. Super Undies was founded by a mother in need of a solution. Her potty-trained toddler was so proud of his newfound skill that he refused to go back into diapers, but he still had many accidents. She needed a reliable pair of waterproof underwear to “trick” her kid into thinking it wasn’t a “diaper” while still getting the protection she needed for her couch and car.